"The Crystal Children’s Centre provides a complete package of care for new papa and mum for their sweet toddlers. Under the able guidance of Mrs Gunja Chauhan, the whole bevy of teachers and the para staff work in tandem to see that the toddlers are rendered tender care and joy to toddlers. This day care centre and a play school is not a school in real sense where usually u see a teacher wielding a stick in her hands with bouts of shouts. The ambience here is so serene and soft for all children which I think may be non-available at home. With a homely touch the children are given hygienic food and yes I have seen the children being pampered on nice bedding for a nap. It is a complete package where all alma mater is also being taught which includes slight mental but more of physical activity that in long run enhances the motor coordination along with early appearance of certain milestones. There are all teachers totally dedicated and always smiling whenever the parents arrive to pick to drop or pick their children. The staff is damn professional, adorned with bounty of humanity, modest and care for the children." Crystal is not just a day care for me, but an addition to the aides available for good parenting. The facilitators at Crystal take the extra effort to understand and know the child - and help and support me in dealing with their problems. The team at Crystal is right skilled to take care of the needs of children in all age groups." "First and foremost my sincere congratulations to 'CRYSTAL' for the unique concept of upbringing and entertaining young kids. My son SOHAM has a unique distinction of being the first 'CRYSTALITE'. There was a time when Soham was the only kid in the Crystal day care, but he gets the same attention and care (rather even more). 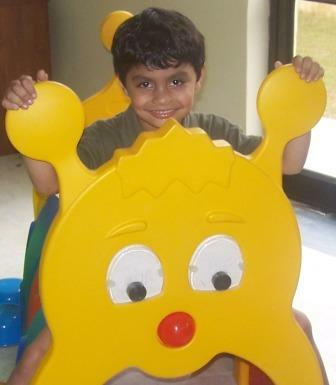 Now when he has so many friends around in daycare and offcourse the fun with so many friends is real bonus for Soham. Crystal has been such a nice experience for us as working parents and for Soham who has been treated like a family care with proper food, breakfast, games, dance, artncraft and lot of love and affection. For us Crystal has been Home Away From Home"
Reshma Malhotra, Officer Incharge, Accounts, Thermax Ltd.
"After I recovered from my maternity break, I was skeptical like hell as to where to leave my daughter when I'll resume my work. I thought of various options like hiring a care taker, working from home etc. But nothing was helping me out. I never trusted putting my daughter in a crèche as I had heard a lot of bad things about it. On an impulse I admitted my daughter to Crystal Children's Centre without thinking so much. But even then I was very afraid and skeptical. I often did surprise visits to the crèche just to check out if my daughter was looked after well. I felt great when I learnt that Crystal is just like home away from home. Jaanya gets proper attention. She gets nutritious food. She has made very good friends there who are like her family now. Various events like friendship day, republic day etc helped her coming out of the shell which in turn made her more confident and sharp. Now, I rely on Crystal so much that I can concentrate at my work without worrying much about her." "Seeing Arushee cut the cake amidst all her friends said it all for me. She enjoys being a part of this close-knit team led by the ever energetic Mrs. Gunja Chauhan and Mrs. Singh. As a parent, it is very important to trust the place you allow yourself to leave your precious tots for most part of the day. And I don't hesitate to say that I'm rest assured with Arushee under the care of Crystal Children's Center. Increasingly, I'm seeing Arushee develop new skills under the caring hands of Crystal teachers." "My son Praduymn has been part of this centre more more than 1.5 years and its been a great experience for us in terms of a homely environment,good emphasis on basic values and mannerisms and warm folks taking are of the kids.Its in reality a home away from home for these tiny tots...."